Have a great app idea that you want to turn into a mobile reality? Now, you can make an Android app or iPhone app, BlackBerry app, etc with no programming skills needed. If you want to create an Android app or BlackBerry app, for your website, blog, business or someone by you don’t have any idea how to do so. I'll show you some cool websites that'll do that for you for free or almost free price. Read the full article to get a list of the 5 best websites for creating Android apps online. Do you know that you can easily create any type of Android application or BlackBerry app, like, browser, website app, blog app, video downloader app; image feed app or any other common app in just few minutes. You don’t even need to have a single knowledge of coding to proceed. How to quickly create any android application or BlackBerry app without coding knowledge. Let quickly take a look at the 5 best sites to create android apps or BlackBerry app. AppsGeyser is a very popular site to create android apps. Most internet marketers do make use of this website to create android apps for their branded product. You don’t need to have a single knowledge of coding you can use the website. Simply visit the website, create an android app for free, distribute for free and even get paid for the ads placed on your app. This is another site that can help generate an android app for your brand. With Appyet, you can get a professional android app in 5 minutes without a single programming knowledge. All you need to do is to provide them with the rss/atom of your website, and the app is ready. 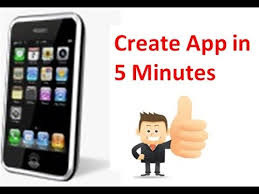 This is another great website that can create you a mobile app in few minutes. With this website, you can easily get your android app ready. The website also has room for creating iOS apps. Appyie is yet another sure website to create android apps. In this website, there is room for monetization for your app, push notification, analytics and others. Simply visit their website and get started. You can easily create both android and blackberry 10 applications with Appclay. Other features of the site include creation of shopping apps, website apps, blog app and others. Related Posts: Android Tips, BlackBerry Tips. Labels: Android Tips, BlackBerry Tips. ok @Summit Pathak. Tnx for reading and dropping comment on my post.